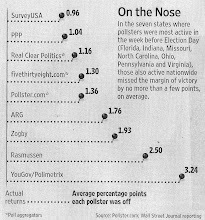 Public Policy Polling: Operation Chaos 2012? We finally found a poll that Sarah Palin does well in with Democrats- when you ask them who they want the Republican nominee in 2012 to be. We posed that question to Democratic primary voters in both Ohio and Wisconsin last week and she came out with a much bigger lead than she did with Republican voters in those states. In Ohio she's at 22% to 16% for Mike Huckabee with no one else even hitting double digits. In Wisconsin she gets 21% to 15% for Huckabee again with no one else hitting double digits. The plurality of Democrats- 36% in Wisconsin and 33% in Ohio- said they had no opinion about who the Republicans should nominate. But it's clear that a lot of the voters who do have one see Palin as easy pickings for Obama and as a result hope she gets the nomination. And our general election polls in those states support that line of thinking- Obama led Palin by 14 in Wisconsin and by 7 in Ohio. This is actually more than a hypothetical exercise- it suggests the possibility that in states with open primaries Democrats might go vote for Palin in hopes that Republicans get their weakest candidate. The party may have an 'Operation Chaos' of its own in 2012. There is a countrywide movement planned to ensure Palin is the nominee. Check out http://www.primariesforpalin.com. They have a state-by-state voting guide for the primaries and will officially launch their site after Palin announces that she is running. You guys are naughty... lol. The aforementioned movement is for liberals to purposely vote for her in the primaries. As polls have shown (http://www.primariesforpalin.com/?page_id=26), she is the weakest candidate against Obama. It is being dubbed "Operation Lipstick". Palin is THE STRONGEST Republican candidate!! Her approval ratings among those who actually take the time to the learn the truth are higher than any other Republican candidate. Palin will likely mop the floor with Obama anyway. But if delusional leftists want to help her, be my guest. CL, where are the crosstabs on the demographic "those who take the time to learn the truth"? We didn't ask people a question "Do you take the time to learn the truth? If yes, press 1. If no, press 2. If you're not sure, press 3." It must be some elusive "silent majority" because poll after poll from us and every other pollster has shown Palin with the worst favorability numbers among all voters and doing the worst against Obama of all the Republicans tested against him. I'm not surprised on the WI and OH findings. WI is an open primary state, and OH is a semi-open (you only have to sign a paper on the day of the polls saying you will uphold Republican values or some BS like that). Good idea on primariesforpalin.com. Too bad not all states are open primaries, it would make this so much easier. However, the state guide is good in that it links people directly to the forms they need to fill out to vote in Republican primaries. People can always unaffiliate after voting too, it's not permanent. You do recognize that a solid 10% of the Ohio Democrat Party are voting for her over Obama in the general according to your own polling. So it's possible that around half of the Democrat Party identifiers who say they would like her as the nominee are the same Democrat Party identifiers who would actualy vote for her over Obama because they prefer her to Obama. If Sarah Palin is as smart as I think she is, and as dedicated to our country and conservative causes, she will keep doing what she is doing right now--energizing the Tea Party conservatives. I hope she does not run in 2012 because having stepped down as governor before completing her first term (albeit for good reason) will prove insurmountable. She needs to get behind the strongest real conservative out there--that would be Mike Huckabee--and after the election be free to focus her considerable talents in his administration--hopefully charged with making us energy independent. I LOVE Sarah Palin, bts. I am all for this! The Republicans deserve to go down in flames for inflicting Sarah Palin on this country. I'm all for giving them a bit of a push towards the inevitable self destruction of the Republican Party. In fact, I am willing to take it past just voting for her in open primaries: I recommend Democrats register as Republicans as soon as she announces her candidacy so that we can vote for her in closed primaries too! I am going to do just that. "If Sarah Palin is as smart as I think she is"
So if she's as dumb as a rock? "having stepped down as governor before completing her first term (albeit for good reason)"
To the Sarah Palin fan who said she should support Mike Huckabee. What do you think about the fact that Huckabee has stated on record (in a video) that he believes in man made Climate Change? Obviously for any sane person that's a positive thing. But for the Republican base that seems like a deal breaker. Video of Huckabee Saying he Believes in Climate Change. I'm Ohio. If Sarah is only 7 behind Obama in a biased overDem-weighted poll, then she'll beat him if the economy is still terrible and we are still bogged down in Afghanistan. Once her REAL record is reviewed of her accomplishments in Alaska and she continues to tackle policy like she has been doing, she can defeat him. However, what happens if her friend Rick Perry runs instead and she endorses him? Cakewalk for the GOP if the Messiah does pull to the middle very quickly. "If Sarah is only 7 behind Obama in a biased overDem-weighted poll"
According to the 2008 exit polls, Democrats were +8 over Republicans in the partisan breakdown of the electorate. In our poll, they're only +5. So this is a slight reversion.